The human brain has many roles within the body, and one of them is to decide upon, initiate, and modulate, any movement. How it does so, through a collection of chemical and then electrical processes, requires the study of a vast and not-yet-fully understood field of study - neuroscience. The following is a very basic explanation of how the brain and spinal cord make the muscles of the body work to create movement, and how, amazingly, the design of the brain and the design of the Minimalist Golf Swing are very much in sync! All that exists in the different areas of the brain is bundles of nerves richly supplied by blood. 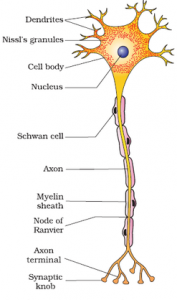 A single nerve has a somewhat balloon-on-a-string appearance, with the balloon being the “cell body” that conducts all the processes of the nerve cell, and the string being the “axon”, that transmits electrical “messages” to muscle. The parts of the brain that contain cell bodies are called gray matter, while those that contain axons are termed white matter. 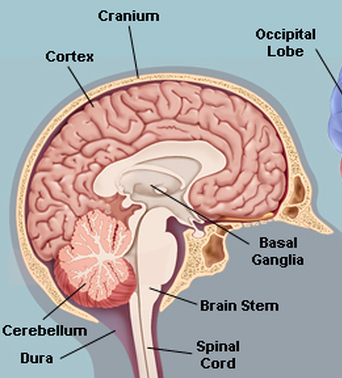 The outer layer of the brain is the cerebral cortex made up of gray matter, and inside there is white matter as well as some internal gray, such as the basal ganglia. The primary motor cortex (PMC) has different parts of it that send messages to muscles in different areas of the body. 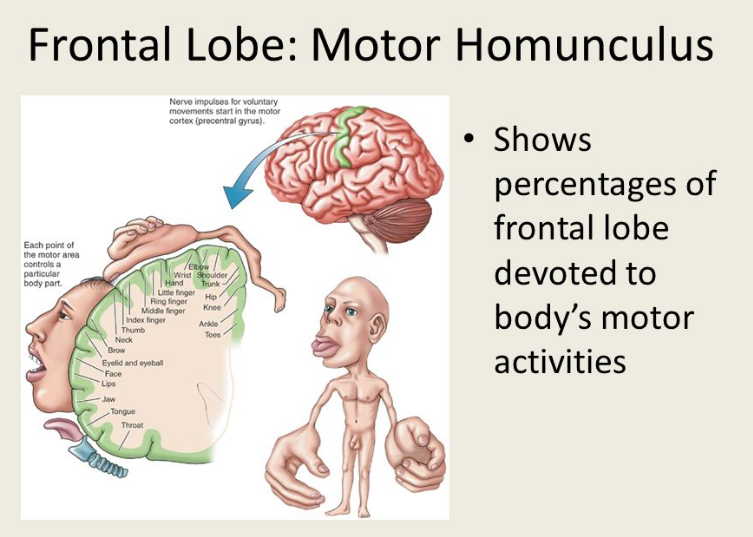 This very carefully mapped-out “chart” is called the homunculus, and it can be seen that while the brain reserves a large part of the PMC for the movements of the face and limbs, only a very small part is reserved for movements of the trunk. 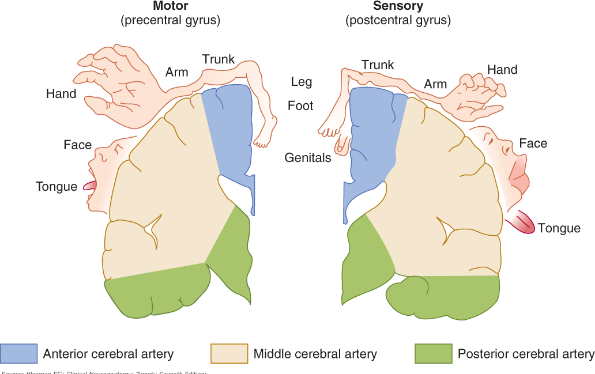 Even the blood supply to the different parts of the PMC follows the pattern of the homunculus, so that different arteries supply blood to those areas that subserve trunk motion, compared to those that connect to the face and upper limb (The trunk area, see pic. below, is supplied by a different artery than the face and upper limb). 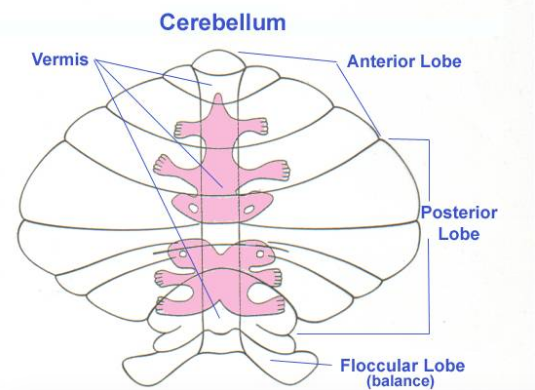 The same pattern is seen in the cerebellum (pic below, trunk in the midline, arms and legs more lateral). Its most central part subserves trunk motion while the more lateral parts are responsible for limb movements. 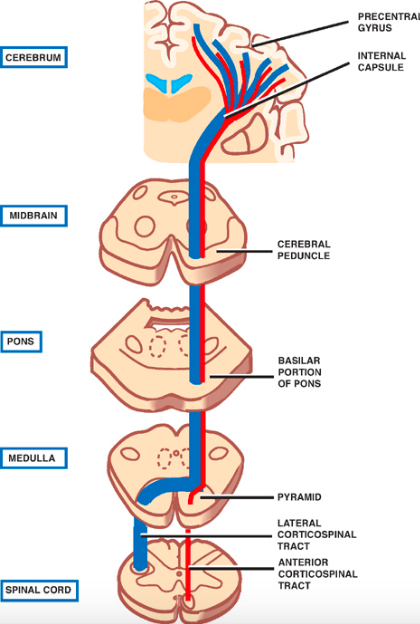 As for the basal ganglia, it is said that one of the roles of that part of the brain is to position the trunk to facilitate anticipated limb movements. All of these are gray matter areas. However, even the corticospinal tracts that send messages down the spinal cord and eventually to the nerves that reach individual muscles, have one section that mainly sends messages to the trunk (anterior) while the main section (lateral) sends instructions regarding movement to the rest of the body. (See the difference in the anterior and lateral corticospinal tracts in pic. below, and that the blue tracts are much larger than the red). So it would appear that the brain, overall, does not reserve much area for movements of the trunk, and some parts of the brain actually position the trunk in advance, to allow required limb movements to become easier. At the same time, the brain is able to fine tune a lot of specialized movements of the upper and lower limbs, which, in the case of golf, involves mainly the arms. Why then, does the “classic” swing require one to rotate the entire trunk during the back and through swings? Why does the “modern” swing expect the pelvis and hips to initiate the downswing? Of course, in the latter case, some might say that the stretched core muscles contract to produce torso rotation, so no active brain instruction is necessary. To an extent, that is true, because rotation of the trunk could be thought of as “free” (from the stretched muscles contracting forcefully). However, the modern swing also requires weight-shift towards the target, and, in addition, many people in golf believe that a “squat-jump” type movement needs to take place during the downswing, both of which require considerable voluntary - “paid for” leg-muscle action. How is the MGS a perfect match for the design of the brain? It rotates the entire spine before the swing even begins. That is a voluntary (brain controlled movement) but there is plenty of time to get the rotation done. Then, in-swing, it uses all the “free” energy of stretched core muscles (which are stretched to a greater extent than in other swings); with greatly reduced “paid for” intentional movements of weight shift and upward torso rise, which require active muscle-work to achieve. Bottom line, it simplifies the job of the brain, so that it does not have to create fast, coordinated, intentional movements of the trunk while also co-ordinating arm motion, especially because the golf downswing only lasts 1/3rd second, at most. Why overpower the brain? Let it do what it’s designed to do best during the fast action of the swing, and complete the actions that it obviously does not prioritize, in advance!